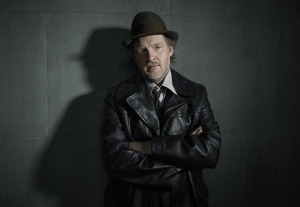 On Saturday at the TCA Press Tour, we were able to do a one-on-one interview with the fantastic Donal Logue, whose Harvey Bullock is one of the highlights of the FOX series Gotham which sees a new episode airing tonight at 8PM (ET). “I have to say, it was an episode that I was lighter on,” Logue admittted, but he still had some fantastic things to say about tonight’s installment, which is called “What The Little Bird Told Him.” “I loved [Christopher Heyerdahl]. He’s a fantastic actor, and Eagle Eglisson was the director. He’s amazing. He did a really great job. People have been talking about how visually stunning and how good it is, so I’m excited to see it,” Logue said. 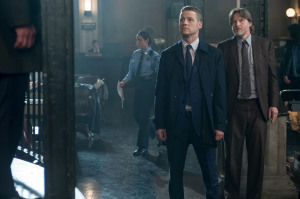 Gotham as a series featured Bullock with almost as much screen time as Ben McKenzie’s Jim Gordon — but with such a large cast, the roster could often change. “There are just so many stories that they have to tell, and there’s a lot that I would like to see — the villains, and there’s a lot of worlds. It’s hard. Whatever is best for the show. There are a lot of people who need to be busy, and it’s only one episode at a time to fill,” he explained, before being asked specifically about the recent Harvey Bullock-Alfred Pennyworth team-up that Logue had with Sean Pertwee in a recent episode. 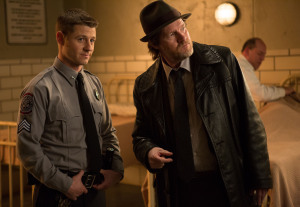 Moving back to Jim Gordon’s primary partner in crimefighting, Logue said that working with Jim Gordon has woken Bullock up. “It’s an exciting new world, and it’s kind of on the right side of what he used to be,” he said. “I don’t think Harvey Bullock is an @$$hole. I don’t think he was a bad cop, and I don’t think he was really dirty. I just think that someone like Jim Gordon who really wants to change the city, he signed up to be on board with him, and he’s done it. Jim’s in Arkham because he got busted for taking on the Mayor and everybody, and Harvey was by his side,” Logue explained. 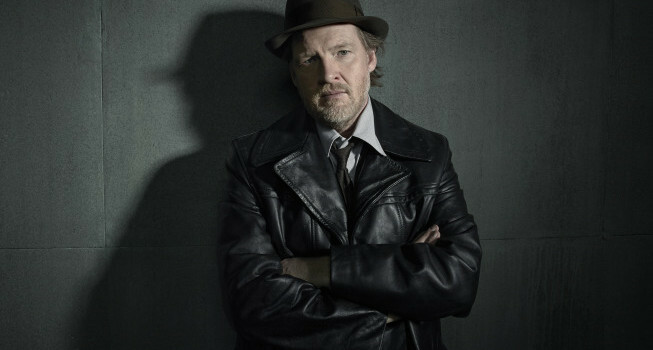 Prior to getting the role on Gotham, Donal Logue was familiar with Batman: The Animated Series and the acclaimed comic book series Gotham Central, where Harvey Bullock is played a bit darker. “I can’t do what someone else did, and I don’t want to imitate anyone else,” he admitted. “The Gotham Central Harvey, he’s crass. He’s super homophobic, he’s dark, dirty, street, right? [But] we live in an 8:00 universe, and I kind of think that if [TV’s] Harvey was that dark, he could last a couple of episodes, but you couldn’t go in the long term with him, if that makes sense,” he said. 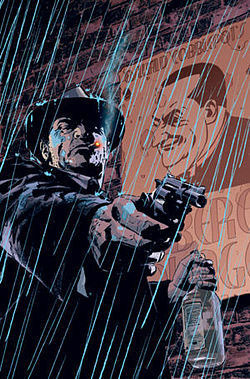 Gotham Central was a notable comic book series in that it brought characters like Renee Montoya and Crispus Allen to the forefront. Are we going to see more of them being problems for Harvey? “I miss ’em,” Logue said. “I haven’t seen a lot of Montoya and Allen around lately, and I desperately want them to be [around]. I love those two. It’s weird, because when you’re doing the pilot, you really feel like this is the world you’re establishing, that every episode is going to have this dynamic of Montoya and Allen, and this and that, and it’s just a big world, you know? I haven’t seen Montoya outside of scenes with Barbara, and Allen I haven’t seen in a little bit, so hopefully they’ll be back,” he wished. Dr. Leslie Thompkins, as played by Morena Baccarin, is a newer addition to Gotham’s world, and Logue thinks that Harvey does trust her, though he might not want to like her. Why? He’s jealous, in s way. He feels abandoned – Jim Gordon’s one of the few things he’s got – but she’s good at what she does, and she’s really nice to Harvey. I think it’s begrudging,” he admitted, before saying that Harvey is horrible with women in general. “He’s probably the most f—ed up man in terms of just relationships and intimacy, so he’s just dismissive of Barbara, he’s dismissive of Thompkins… whatever. He’s [also] threatened by other men who could have an actual relationship with a woman,” Logue said. When asked if Bullock is threatened by The Penguin, Logue told us that he should be more threatened by the Penguin. “He should be scared of the Penguin. I always feel like, man, I’ve threatened this dude… I told Jim while he was in the trunk to put a bullet in his head. He can get me almost any time,” Logue said. The strongest impression from the interview is that for the cast, Gotham is a team effort. “I’ve felt from the get-go, Ben’s the Captain, Ben has to carry the hardest load, and he doesn’t have the colors that we get to play with sometimes. I can get cheap laughs. I’ve felt that whoever played the Penguin, before I knew it was Robin, I felt like in the pilot, that would set the critical tone of the show, because if this person had gravitas and was good, the whole show would veer over the edge of being taken seriously in that regard, and Robin, I think, has done that for our show. Cory who plays Nygma is a brilliant guy. He’s had to play this one note for a long time, and it’s going to be cool as sh*t when Cory gets to unload and be dark. Jada has been amazing; she’s just cool, you know? Everybody is happy when she is there,” he said, adding that when not everyone is there, everyone is missed. Could we see all of these characters coming together as the season comes to a head? 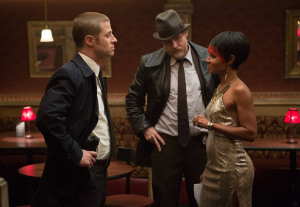 Gotham is new tonight at 8PM on FOX. Take a look at some promotional images from the episode here and be sure to come talk about this week’s show on our Gotham forum!